ISLAMABAD: Pakistan would not tolerate drone strikes in its territory as these are against the sovereignty of the country, said Foreign Office Spokesman here. 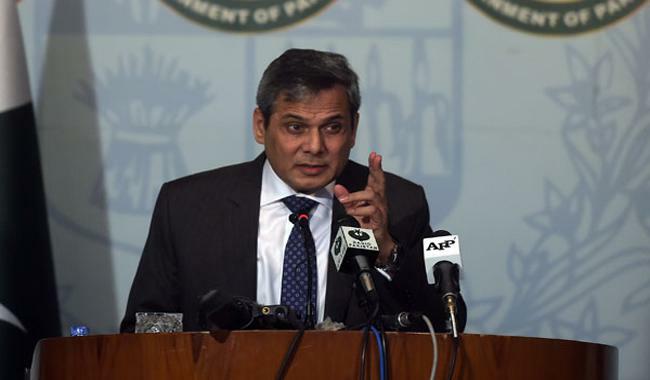 Foreign office spokesman Nafees Zakaria, in a weekly media briefing, was commenting on Iranian drone shot down by Pakistan inside its territory. Islamabad on Wednesday confirmed the Iranian Unmanned Aerial Vehicle (UAV) was shot down in Balochistan’s Pangur district along the Pakistan-Iran borer on June 19. "The drone was hit by Pakistan Air Force as it was unidentified and flying around 3-4 kilometers inside Pakistani territory." Pakistan is committed not to let its soil used against any other country, the spokesperson reiterated. Nafees Zakaria said war on terror is in Pakistan's own interest. He refused to comment on the news circulating in the foreign media regarding Pak-US relations. To a question, the spokesperson said Pakistan has already expressed its desire to work with the new US administration. Pakistan and China are working together for restoration of peace and stability in Afghanistan. “Islamabad will welcome any delegation from Afghanistan as such visits will strengthen bilateral relations and help resolve Afghan issue,” he added. He said Chinese role in promoting Afghan reconciliation process aimed at restoration of peace in the war torn country is important.